MALAPPURAM: MG University champions Nirmala College, Muvattupuzha, became the first team to enter the semifinals of TNIE GOAL 2017 all-Kerala inter-collegiate football tournament after defeating Baselius College, Kottayam, 4-1 at Malappuram District Sports Council Stadium on Tuesday. The winners made light work of reaching the semifinals, scoring early against a depleted Baselius side after Jithin M gave them a flying start by scoring in the third minute. Quickly onto a ball played over the defence by captain Ajith Shivan, Jithin ran with the ball towards the goal before shooting past the keeper from a tight angle. He almost doubled the lead in the 13th minute, but was stopped by Baselius custodian Jaimy. Nirmala’s attacks came down the right in the early minutes and were once again the outlet for attack when Sachin T Sivan ran past defenders and hit the woodwork in the 23rd minute. Sachin, who scored a brace in pre-quarters, doubled the lead four minutes later when he headed in a freekick flicked by Jithin. Missing a string of players, who were away playing for their university, Baselius put up a tough fight and came close to reducing the margin in the 34th minute when Dibin M D, their best player of the day, went close from a freekick in front of the goal. Abhiram Shaji made it 3-0 for Nirmala five minutes into the second half after tapping in a cross. 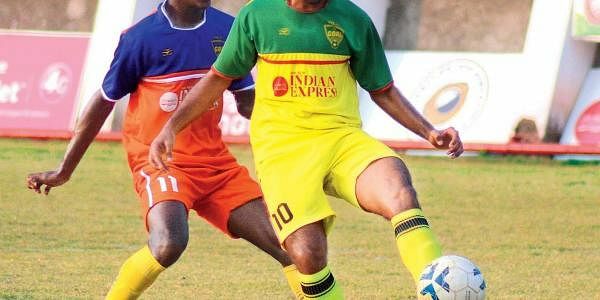 It was too little, too late for the Kottayam college as Nirmala upped their three-goal lead with Abhiram finding his second goal in the 73rd minute to ensure his side cruised to the semifinals.